I needed to get a post out about one of the more exciting plants to make its home in mine. This is all about the Goldfinger Banana!! One of my colleagues at work lives around the Doncaster area (and talking about in Melbourne, Australia), and I am about 20 kilometres South in Bentleigh. There is a big difference between the two places – Doncaster has the kind of rich fertile soil I am working towards, and was home to many farms and orchids even until recent times. Bentleigh is one of a group of suburbs known as the Sandbelt, with poor quality loose soil over a clay base. Great for golf courses, not so great for gardening. So one day my colleague brings in a little pot with a banana plant, wearing a big smile and telling me that the mummy is a great producer, even for Melbourne (cold zone 10, hot zone 4). Not only that, but it seems that it is not uncommon for people to be growing bananas in Melbourne. The photo below is the baby banana, about double the height from when it was planted. It grows beautifully in our Summer conditions, and does not seem to mind Winter at all. That said, I am creating a micro climate around the plant to reduce wind strength and maintain soil temperature. Notice the bricks and rocks around the plant? They are there to capture heat from the day and release it back into the soil overnight. The car tire compost bin / worm farm combo is sitting close by as a wall of sorts and to provide a constant supply of vermicast leachate. A retaining wall at the front (out of screen) will hold a high mound of earth to divert the wind and be home to a variety of herbs such as stinging nettle, nasturtiums, and marjoram. A Chilean Guava has been planted on the left hand side (out of screen) that will grow into a very handy windbreak at 2 X 1 meters. This is what a Goldfinger banana looks like as it grows up. And this is what the one from Doncaster looks like. You can see the 6 foot fence ending at the bottom left so this thing is at least 14 foot tall! An impressive flower… Most impressive. Set the plant into a very high quality soil, the best you have. Bananas are heavy feeders, so keep adding organic material, or start making your own coffee compost. Bananas love nitrogen and potassium, which means adding things like used coffee grounds, spent plant material, manure, citrus peels, and seaweed extract. An environment that maintains an even, preferably warmish temperature. A steady supply of water. Protection from the elements from the company of other plants, shrubs, and herbs. As in the picture below, the banana is about center. And on the right is that retaining wall in progress that I mentioned earlier. And here is a banana tree update – August 2012. There is now a lavender growing nearby and in-front is a tire pond (under construction). Another one from August 2012. At the base is a good amount of coffee grounds for fertilizer. Fingers crossed the next update has some fruit in it! Tags: Banana, flower, growing, how to grow, Melbourne. Bookmark the permalink. So pleased to read these comments. Mine is about to flower. (Not opened yet). Was excited but thought it would be too late to get fruit. I am so happy to here the fruit will surve the winter. I live in south east SA so climate should be similar. Might struggle. You could try get them in the warmest less windy spot and see how it goes. Plant them deep also to keep the roots as warm as possible. Bananas are the easiest tropical plant to grow in my garden. I start mine off in extremely large pots, let them get big enough and then take it out of the pot but leave raised above the ground. Pile on more soil and cover with sugar cane mulch… this prevents the plant being water logged. I just did the same thing to my coffee plants today, I have 4 with one that actually flowered and had about 7 cherries last year. Here’s hoping they all flower and fruit next year! 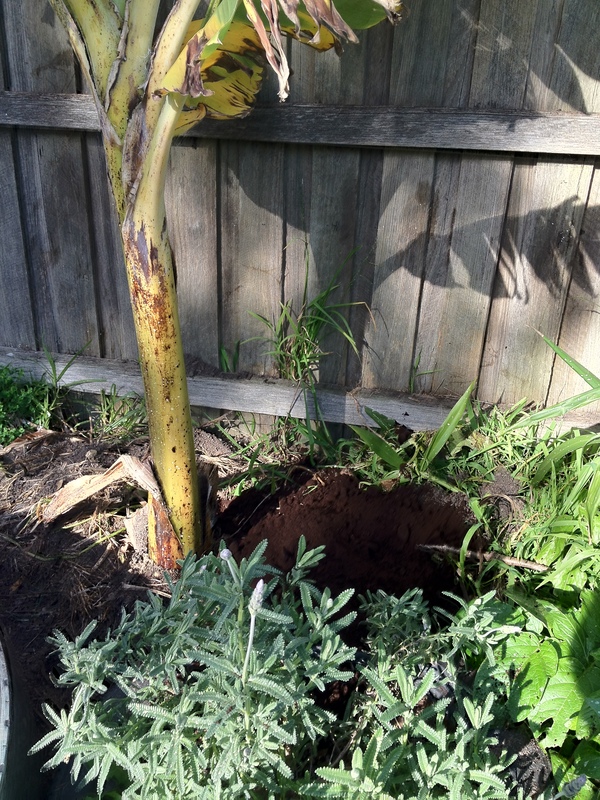 I also have sugar cane, that is a metre tall, curry leaf about 2 metres tall, about 3 avocados… all in pots. I find the slight elevation is enough to protect it from the frost as the frost is always closer to the ground. PS. I’m in South Morang in the northern suburbs. I chop down the plants and compost. I have a compost tumbler that I use for my bokashi and lawn cuttings, and once they has semi composted I feed the contents to the wheelie bin worm farm I have. The worms seem to love the bokashi providing its not provided straight from the bucket. For the avocados, I actually have 2 that I grew from seed (Hass), and another I got from a nursery (Fuerte). I had flowers on the Fuerte this year but none pollinated which I expected. While I do like container growing, I think it’s only suitable for 1-2 years before you then plant in the ground. In the case of the Fuerte, I just took the plant out of the pot this weekend and placed on top of the ground followed by heaping some aged manure blends around the side and topping with sugar cane mulch. The hope is that since the plant is not dug into my heavy clay soils, it will still flourish like it did in the pots. Have done the same thing with the bananas which I started in pots and then moved into a raised mound situation and they seem to thrive much better that way. Do any of you enthusiastic banana growers know when the best time to plant. We live on the Mornington Peninsula but have a very sheltered spot for the banana. Hi there Jane. I planted one of mine in late August and the other in September. If you have a sheltered spot then it should do very well. Mine get a bit too windy and suffer for it, so am moving them around the side of the house close to the ducted heating unit! Have you already bought the plants, and is a specific variety you had in mind? How big do the roots of banana trees get, does anyone know? Congratulations on your wonderful site! 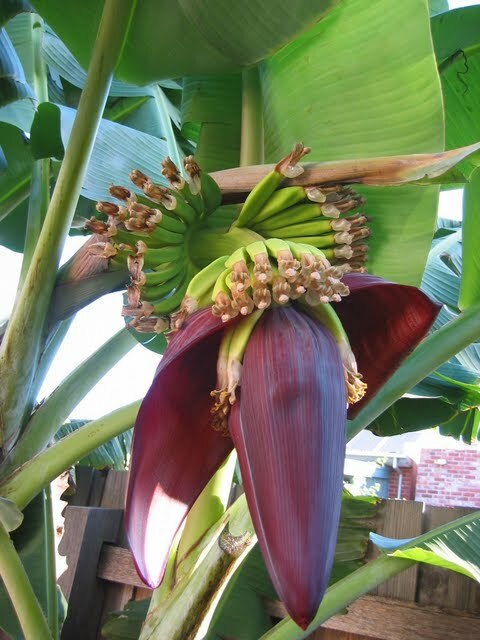 I am very interested in growing “plantains” or cooking bananas in Melbourne, just for personal consumption, though I am not sure where I can get the plants; or, if the same conditions used for growing typical bananas apply. Hi Karlita, thank you for writing in. I think its going to be real tricky getting plantains to grow in Melbourne. It actually really hard just getting a cool climate variety to grow here. You could probably buy them to eat, but not to grow here. Too much of a tropical plant I reckon without a temperate variety available (that I know of). Hope that is of some help, and you know sometimes I wish we had weather like in Cairns. You can grow anything up there! I have a hand of bananas on my plant in Newport Melbourne and I frequently get bats and possums. Can anyone tell me when I should cover the bananas? I have been told to wrap them in a plastic bag – is bird net ok? Oh my plant is 3 years old and has a full size pup which I left in to replace the original one. Hi there Nola – this is the product I’ve already bought to use on mine, when eventually it starts to show. http://greenharvest.com.au/tools/plant_protection_prod.html#BananaRipeningBags. How long have you been growing bananas for? Hi Nola. Yes to fertilise now, with as much organic material as you can supply it. As for possums, can you get a plastic band around the trunk, and do they have access from the top, i.e. overhanding tree branches? Ok, so its the end of April and my banana “patch” (about 8 plants) that started as one from Bunnings about 4 years ago, has flowered and has a huge bunch of hands hanging off it. They are only young bananas, and I only noticed when I saw the flower ‘covers’ that had fallen on the ground today!! As we are half way through Autumn and heading for Winter, I am wondering will they or when will they grow and ripen??? Should I cover them during winter??? Or shall I just let nature take its coarse and see what happens?? Any advice from anyone… I shall start to feed it heavily in hope of tasty healthy happy fruit, but what else to do??? Hi Chris, great news on the banana patch – exactly what I’m trying achieve in my backyard. I’ve spoken with my expert on growing bananas and have been advised that they will be fine as long as they were pollinated before the cold arrived, which is likely given the flowers have dropped. They will store like that no worries over Winter, and come Spring, will start to grow again. Best of luck with it, and please let us know how it goes. ps – possums and bats may try to eat them at some stage so have a bird net handy! Our local nursery had just stocked a wide range of ‘Cool Bananas’ with several varieties available. I can’t stop thinking about them. Thanks for the info. No worries Donna. Did you end up getting a cool banana? They are a real treat to grow. Bananas grow quite well in Sydney, especially along the hilly beach suburbs (frost-free), as banana trees hate frost. It’s not the frost that does the damage, but when the sun comes up the little frost globules act as tiny magnifying glasses which burn spots in the leaves. So if you see frost on the banana leaves in the early morn, hose them off before the sun comes up. The best bananas I have seen here were grown by a guy who used to use chopped-up cow ordure, coffee grounds, and, BONG WATER. The bananas will grow to full size. That is great advice about the frost James. I will be sure to watch out for it during the colder months. Now as for the bong water, it might be hard to find around my place but will look for the closest substitute – urine perhaps?! Thanks for this Shane – what a great site. I never would have thought it possible to be able to grown Bananas in Melbourne – but such is the wonderment of life. Keep up the great work! Thanks for stopping by Gordon. Is that as a monkey? What a great tree this banana! love your site so keep them coming. Why thank you Rob. Glad to hear you like the site. 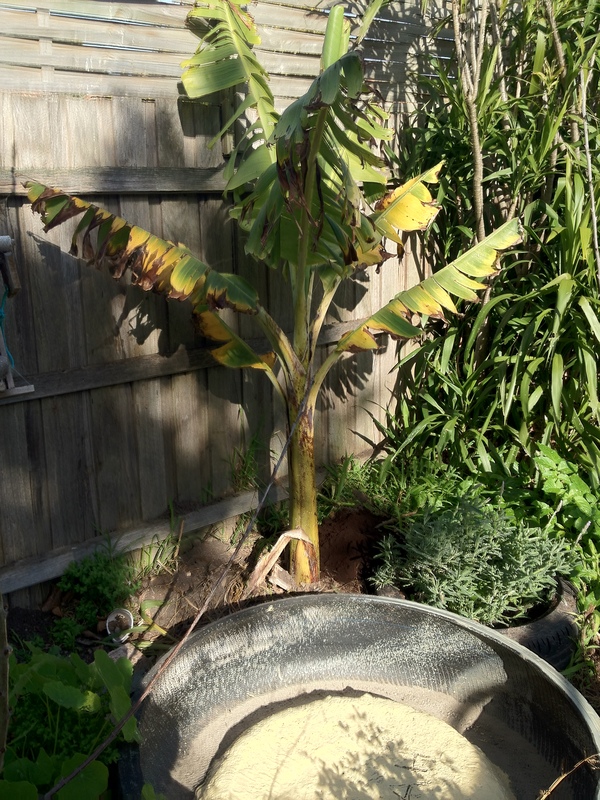 Just one minor update – the young banana plant is thriving in Doncaster, while the mature plants live in Armadale. When I bought my Armadale house, the soil in the back yard was filled with rubbish and stones. It took a lot of work to clean it up, but the success of the bananas was a great surprise and reward for the effort. I tried other varieties, but only Goldfinger could cheerfully cope with Melbourne’s winter. In addition to compost, bananas like lucerne hay, plenty of water, and a very sunny position. It was about 3 years from when I planted the bananas to when I harvested the bunches early this year (2011). Very interesting, Shane! I especially like the flowers. My gf is enthusiastic about gardening (and used to live in NZ); she’ll like this a lot. That is fantastic Eric. It has been heaps of fun to be growing a banana plant but can you imagine the fun I will be having with flowers like those all over the place!